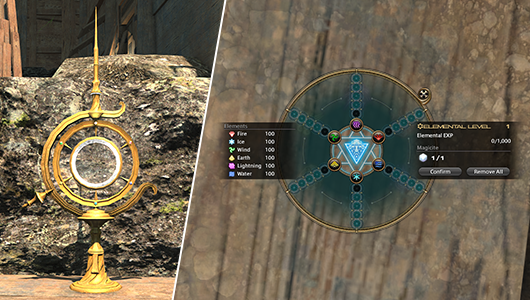 Instead of the normal levels, Eureka has a separate element-based level system. Players need Magicite, which can be used in the Magia board to change their elemental strengths and weaknesses. The Magicite is obtained by leveling as well as completing quests within Eureka. In order to be able to pack the Magicite on the Magia tablet, you have to use the Magia Melder in the main camp at the entrance. It's the only place players can place their Magicite. You can also see how much bonus each element receives by inserting the Magicite on the display of the Magia Melder. For example, two Magicite players give a 52% bonus. Basically, you want to adapt your element to the opponent, which you fight at the moment. To make this fast in combat, the board can be rotated. Against which elements the opponents are weak, can be seen directly on the Magia board, if you aim at them. One can use the elementary properties offensively and defensively. In this case, the monster being targeted is wind elemental. The DDs and healers should invest their Magicite in the element ice, so they can do more damage. The tanks, on the other hand, should choose the same element as the monster, as they will take much less damage. Its own elemental properties can be changed at any time by turning the magic board. A completed spin consumes an MA point, of which you can have a maximum of 5. In this case, a turning process consist of several rotations in different directions. As long as the element is not locked, the MA point is not consumed. The MA points are slowly replenished over time or, alternatively, can be directly increased at the Magia Melder.